The tender New Zealand Lamb, marinated and char-grilled, is complemented with a fresh, fruity mango salsa to wake up your taste buds. Mix together the tikka paste and 4 tbsp yogurt, add the lamb, cover and refrigerate to marinate for two hours. To prepare the salsa, combine the mango, red onion, tomato and coriander and mix well. Cover and refrigerate to allow the flavours to develop. Thread the marinated lamb onto 4 skewers and char-grill on a preheated griddle pan for 10-15 minutes or until well seared and cooked through. Alternatively, the lamb can be cooked on a barbecue or under a grill. While the lamb is cooking make the yogurt dressing by mixing together the remaining yogurt with 1/2 tsp mint sauce. Warm the pitta bread and split, fill with Waitrose Leaf Salad with Herbs, some chopped cucumber and the mango salsa. 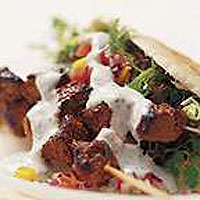 Place a lamb skewer on top and drizzle over some minty yogurt dressing. Add extra zing to the salsa with finely chopped fresh red chillies.